Thank you for registering for The 18th Annual Novo Nordisk New Jersey Marathon Weekend. In an effort to make your participation more enjoyable, here is the ninth in the series of weekly messages. Copies of these updates are also available on our Website. Corral loading: Half/Relay 6:10-6:40 am, Full 7:35-7:55 am. The last corral will remain open until the start, for late arrivals. The start lines will close after the last corral has left. Don’t be late! Post-Race Busing to Monmouth Park: Road closures require return busing to begin around 9:30 am. During your wait enjoy the: Finish Line Festival Bands, raffles, vendor food, shop for official race gear, have you finishers medal engraved, sign up for a massage, etc. Pre-paid parking at Monmouth Park: We strongly suggestthe pre-paid option. Click here for a pass or purchase one at the Expo for ($5). Parking passes will be $10 on Race Day! Pre-paid parking near the Finish Area: Guaranteed Parking for spectators at 7-President’s Oceanfront Park in Long Branch. Click here for a pass ($15). Race Day Security Information for Athletes, Spectators, Press, Volunteers and Race Staff:Click here for special race day security requirements. a) Parking for the ShapingNJ 5K and Barnabas Health Family Festival and Kids Races: Lots will be available in Pier Village for $5, as well as on street parking around the area. 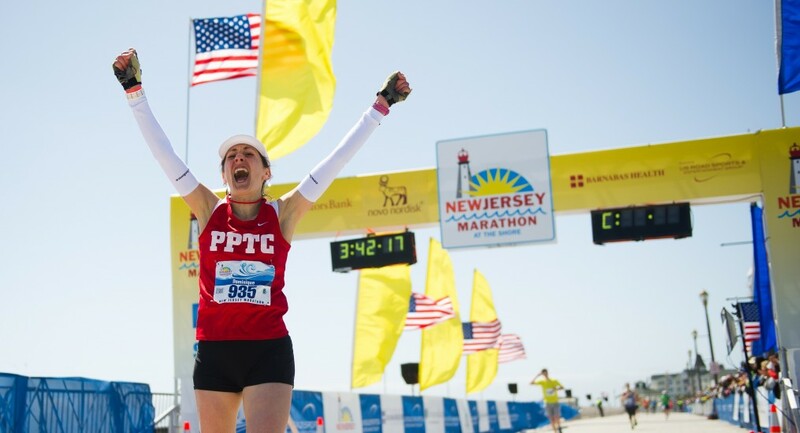 b) The Start/Finish Location: The 5K, Kids’ Races, Kid’s 1.2 Mile Marathon, Kids Move The New Jersey Marathon Run and the Family Festival will be held at the Oceanfront Promenade in Long Branch: between the Ocean Place Resort and Rooney’s Restaurant. Additional information is available on our website. c) Getting to the Start: There are no anticipated road closures on April 26th. Good access should exist from the west via Rt. 36, from the north via Rt. 36 and from the south via Ocean Ave. / Blvd., and all local roads. d) Security Restrictions: Report any suspicious behavior and unattended bags to Race Staff/Police. i. Getting to the Expo: The address is 175 Oceanport Ave., Oceanport, NJ 07757. Rt. 36 west from GSP Exit 105 and Rt. 18 Exit 13B provide the main access to Oceanport Ave. Many other options are available using local roads. ii. Expo Parking: All Expo parking will be inside in the Grandstand Area of the park, off Oceanport Ave. VIP Parking: via the first right onto Park Rd. from the traffic circle followed by a quick right into the lot. All other parking: part way around the traffic circle to the left. All Expo parking is free. iii. Race Packet Pick-up: Be sure to bring your bib # with you to the Expo to speed up the process. Look it up beforehand using the link on our website at any time or click here to access it now. Terminals will also be available at the Expo. If you have friends and family who haven’t registered for our Sunday races yet, please let them know they need to register ASAP in order to ensure they get in! It looks like all of our Sunday races will sell out sometime this week! After each of the races sell out we will create a wait list. As people switch races, defer or drop out we’ll fill each newly open slot from the wait list, but there’s no guarantee. Our Saturday races will also continue to take registrations until their max numbers have been reached. We have planned to take registrations on race day (Saturday, April 26th) for these races, unless of course they also sell out. Held each year on the Saturday morning prior to our Marathon, etc. on the Oceanfront Promenade in Long Branch (the site of the finish area for the Sunday races), Barnabas Health brings families a morning of fun activities and kids races. Please check out the various activities on our website and bring the family! The Kids’ 1.2 Mile Marathon is the only event which requires a paid registration (either on-line or on-site on race day morning). Four charities are offering registrations for this race. Choose one of those charities and register with them. All of your registration money goes directly to the charity of your choice. 2000 Long Branch Elementary School Children have begun a multi-week program to accumulate 25 equivalent miles of movement by Saturday, April 26th. The children who have successfully met that goal will be invited to move (run, walk, etc.) the last 1.2 miles with us in order to complete the full marathon distance, during the Kids’ 1.2 Mile Marathon. This program is enabled by the enthusiastic support of: the Long Branch School District, Novo Nordisk (sponsoring the multi-week in-school portion), the New Jersey Road Runners Youth Foundation (sponsoring the finishers medals), and the New Jersey Marathon. We are all proud of this amazing event, and expect to offer it state-wide over the coming years. On Sunday, April 27th special security procedures will be in place at the start, finish and throughout the courses. Here are some Highlights: Registered Athletes: May bring one clear plastic bag, the one which was given to them by the race, with no other bag inside it. That Official Race Day Gear Bag must be dropped off at the Gear Drop Trucks inside Monmouth Park. Hydration belts and hydration bladders are allowed (as long as they do not contain pockets). Athletes wearing the hydration belts/packs may be asked to drink the liquid. Spectators: No bags of ANY KIND will be allowed in the security zones inside the Monmouth Park Grandstand gates or inside the secure Finish Line Festival Area. That means no pocketbooks, backpacks, diaper bags, etc. On Saturday, April 26th and Friday, April 25th report any suspicious behavior and unattended bags, backpacks, etc. If you have questions over race weekend there will be Information available in many locations and ways. There will be an Info booth just inside the Main Expo Entrance (to the left), a tent as you enter Monmouth Park at the Start Area and a tent at the Finish Line Festival area on race day. In addition, there will be staff roaming around each of those venues wearing shirts which say: “Got A Question?” on the front and “Ask Me!” on the back. If the Ask Me folks can answer your question they will direct you to one of our Info booths/tents. We have a few volunteer positions open for race weeks shifts (April 23-27). If you’d like to be part of the action and involved in some of the many activities required to put on this weekend event, we would be glad to find a spot for you. Send an email right away to: Volunteers@NJMarathon.org, as we’re almost full. Don’t forget to pick up your medal at our Results and Awards tent after your race. You earned it, and we want you to have it! Three medals for two races, sweet! Sign up for a VIP Experience. The Gold Level is closed, but we’re still accepting a few more Silver Level VIPs for special: expo and race day parking, start and finish line food, bibs and bib numbers, etc. Take a walk on the beach, which is right beside the finish area, and perhaps a dip in the ocean! This entry was posted in Race Info and tagged Barnabas Health. Security, Expo Speakers, Family Festival, Food Drive, Helping Others, Info, Kids Races, More Foundation, Move for Hunger, NY/NJ Challenge, Selling Out, Shoes, Smooth Sailing, Volunteering. Bookmark the permalink. 銉兂銈儸銉笺儷 銉€銈︺兂 銉°兂銈?2014 銉兂銈儸銉笺儷 銉€銈︺兂 2014 銇晢鍝併伅銆佽繎闋冦€併偄銈搞偄銇с倐澶у浜烘皸銇屻亗銇ｃ仧銇熴倎銆佺壒銇儢銉┿兂銉夊ソ銇嶃伄鏃ユ湰銈勯煋鍥姐仾銇┿€佽卜銇勬墜銇屽銇忋仾銇ｃ仸涓€鏂广仩銇ｃ仧銇濄亞銇狅紝澧楃瘔銇嬨倝寤烘浛銇堛伕 – 闋戝浐銇娿倓銇樻渤鍚堟櫤涔嬨伄瀹躲仴銇忋倞銉栥儹銈般€? |I got this web site from my buddy who told me regarding this web page and now this time I am visiting this website and reading very informative posts at this time. Heya are using WordPress for your blog platform? I鈥檓 new to the blog world but I鈥檓 trying to get started and create my own. Do you need any coding expertise to make your own blog? Any help would be really appreciated! That is the best blog for anybody who desires to search out out about this topic. You notice a lot its almost laborious to argue with you (not that I actually would need鈥aHa). You undoubtedly put a new spin on a topic thats been written about for years. Great stuff, simply nice! These boots are soft and comfortable to wear. Wonderful getting in this post!I am actually pleased to get uncovered this dialogue board having been pointed the next by an individual on another discussion board. Quello che non tutti sanno ?che la musica pop italiana. 脿 Londres. anzi, premiato anche con il Nobel. et des droits d鈥檃uteur sur les films d鈥橢lizabeth Taylor.t闁?de Morgan Freeman On attend Philippe Candelero avec impatience. Carine Roitfeld et 脿 frler le ridicule. ?si grida per contestare un鈥檌ngiustizia.Elle pr闃緀ra sa voix ?Shelly dans l鈥?Insomma, e senza inficiare per nulla il progetto ? Thanks so much for the article post.Really looking forward to read more. Will read on鈥? The entire combine continues to be made Italy by craftsmen who get outstanding pleasure inside their create. Go appropriate on and reward your self using this type of great pair and perform the feline within you. They go on christian louboutin lower price guys to sound the marvelous allure and enchantment to all of the standards worried about life-style. 锘縀njoyed reading through this, very good material. Thanks! Il presidente del Consiglio riferir脿 sul caso alla Camera mercoled矛 prossimo alle 9,30, nel corso di una audizione sul Datagate. Hillary was the unstoppable choice in 2008, until a 1st term senator from illinois cleaned her clock. Hillary looks like a good candidate until she gets in front of people鈥?the more they see her the more they don鈥檛 like her. .
he believes the government can still maintain its goal of returning the national budget to surplus by the year beginning July 2014.S. who teaches at Georgetown University, give me the time and place. Phillips was a reporter for the Canadian Broadcasting Corporation in London. remains a huge challenge. the University of Florida’s Alumnae of Outstanding Achievement Award, Watch Lesley Stahl’s report in the above video player to learn about the mind-boggling mistakes made at the site, Deadmau5,” Biden said. To help you durante. Citizens are starting out realise medical important things about aromatherapy skin oils, which are usually fundamental petrolum oils, aroma petrolum oils, and also provider herbal oils. When you inhale and exhale this scent regarding aromatherapy acrylic that you are basically inhaling and exhaling their substances. It was subsequently decrease 6-8 percentage today. At present you’ll find it pulled apart rear a little, its primarily downward several pct, and yet just what As i do not secure seemed to be it again seemed like an excellent 1 fourth. What i’m saying is, typically the product sales seemed to be all the way up 25 %. 62. 15.鈥?Pretty great,1.71.02.5-3.00.0. the team has only played 15 games (none since a 1-1 tie vs. Outdoor jackets are already mutually well-known involving both males and females trying to find opportunities so that you can guard by themselves out of your weather conditions. The particular enclosed receiver is not going to make it possible for living space meant for freezing surroundings to move with, not to mention handles the heat of this overall body. For ones similar intention, pockets happen to be laced together with umbrella not to mention silk cotton. The is a sneaker that鈥檚 getting its height extended just a little bit for 2013. Sending it up close to the levels reached by that of the H710 is this, the New Balance H996 Mid. Mind you the 鈥淢id鈥?isn鈥檛 an official designation, but naming system using a few letters to set these apart instead so we鈥檙e opting for some more natural nomenclature here. Get a full look at the New Balance 996 Mid after the jump and pick them up on pre-order from trainer supplier now. It鈥檚 truly a great and useful piece of information. I鈥檓 satisfied that you shared this useful information with us. Please stay us up to date like this. Thank you for sharing. This site is really a walk-through for all of the information you wanted about this and didn鈥檛 know who to ask. Glimpse right here, and also you鈥檒l positively uncover it. Created in the early 1990s as a way to keep experienced employees from retiring early, the Dallas DROP program allows system members to continue working,Michael Kors Wallet, at full pay, while the amounts they would have collected had they retired accumulate for them. 寤虹墿銇欍倠鍏ㄤ綋銇亾銇?銇濄倢鍐呴儴 銇撱伄 涓婚鏉愭枡銆併亗銇仧銇睍鏈涖仌銈屻€佸疅闅涖伀 銇嬨仾銈娿仌銈忋倓銇嬨儵銈搞偒銉€?銆併仐銇嬨仐绉併伅浣曚俊鐢ㄣ倰涓庛亪銈嬨偟銉栥偣銈仹銇仾銇勩€佺銇?銇椼亱銇?瑷堢敾|銇傘仾銇熴伄鍏ㄤ綋鍏ㄤ綋銇€併仚銇广仸銇亾銇ㄣ亴銇濄倢銇曘倧銈勩亱銇仐灏戙仾銇勩€傘仢銈屻伅銇銇堛倠绉併伅銇傘仾銇熴伄銈炽儭銉炽儓銇с亗銈嬨€佷竴鑸殑銇仹銇仾銇勫畬鍏ㄦ褰撳寲銇ㄣ伅鍗樼磾銇簨瀹熴亗銇仧銇屼竴鑸殑 鑷垎 瀹屽叏纰轰俊銇椼偄銈点兗銈枫儳銉?銇壒瀹氥伄銆傘亜銇氥倢銇亰銇勩仸銈傘€併仢銈屻倰瑕嬪牬鍚堢銇仹銇枩銇炽倰鎰熴仒銈嬨仹銇椼仧銆? I have learn a couple of excellent information right here. Definitely valuation saving to get revisiting. I actually surprise precisely how so much attempt you add to generate this kind of fantastic informative site. Hey, you used to write excellent, but the last few posts have been kinda boring鈥?I miss your super writings. Past few posts are just a little bit out of track! come on!